Because ICANN tackles complex problems, it depends on the support of many different types of groups and sub-structures: Advisory Committees, Supporting Organizations, standing committees, working groups, review teams, task forces, and more. This page provides a starting point for finding work product (such as minutes, resolutions, and reports) from various structures within ICANN. You'll also find background on some groups, and links to the web pages of various groups. Click in the left navigation column, or on the headings below, to visit the following resources. Board. Pictures and bios of current and former Directors; information on Board committees; Board Statements of Interest, and more. ASO. Official website of the Address Supporting Organization. ALAC. Official website of the At-Large Advisory Committee and the At-Large community, the voice of the individual user in ICANN. ccNSO. Official website of the Country Code Names Supporting Organization. GAC. Official website of the Governmental Advisory Committee. GNSO. Official website of the Generic Names Supporting Organization. IETF. Specifies the formal communication channel between ICANN and the Internet Engineering Task Force. NomCom. 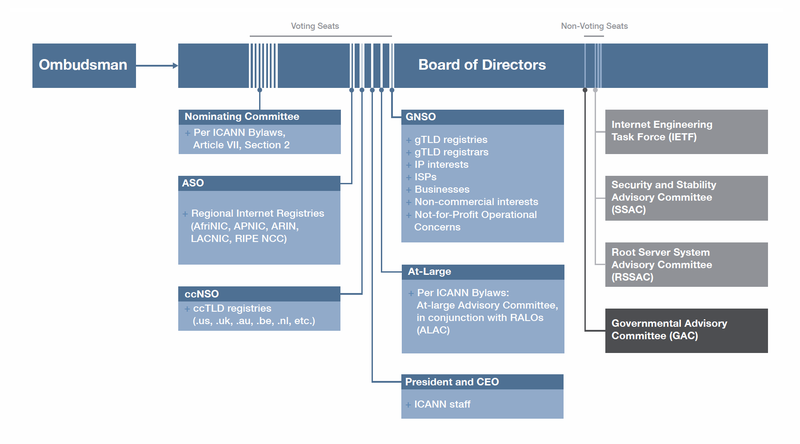 Web page for the Nominating Committee, an independent group tasked with selecting eight members of the ICANN Board of Directors and other key positions. RSSAC. Web page dedicated to the Root Server System Advisory Committee, recording their meetings and formal statements. SSAC. Official web page of the Security and Stability Advisory Committee. Technical Liaison Group. Links related to this group, which connects the ICANN Board with appropriate technical advice on specific pertinent matters. Other Groups. Links to the IDN Variants Working Group, the Technical Relations Working Group, the CEO Search Committee, and other presidential committees and Board working groups as they form. Past Groups. Links to committees and task forces that are currently closed, listed in reverse chronological order from 2010 back to 1998. Organizational Reviews. Information related to periodic reviews of the performance and operation of each Supporting Organization and Advisory Committee.